Put your senses in vacation mode with this Caribbean salad drizzled with honey lime dressing made famous by Disney’s ‘Ohana restaurant. Pineapple, mandarin oranges, dried cranberries, cilantro, green onions and more will tantalize your taste buds. Kick off your shoes. You’re in for a treat! I don’t want to rush things because spring is a perfectly lovely time of year. But, I’m ready for a relaxing summer vacation. Unfortunately, there are many obstacles before me, including the end of school year hustle and bustle. Luckily, I discovered a way to transport my senses, if only for the dinner hour, to paradise. 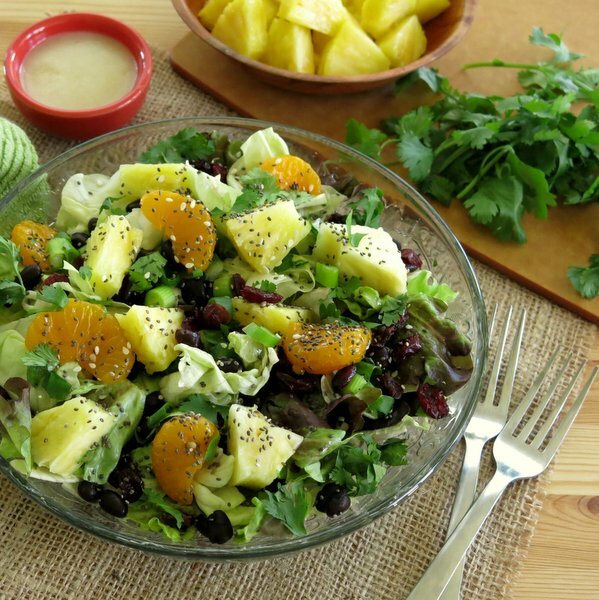 Caribbean salad with honey lime dressing…take me away! Cilantro and green onions add another delicious flavor dimension. And, then there is the eye appeal of sesame and Chia seeds. Aren’t they festive? They add to the mood that I’m trying to set with this salad. Not to mention, I’m always looking for ways to incorporate the powerhouse Chia seed into meals other than my morning oatmeal! I’m still obsessing over the honey lime dressing served at Disney’s ‘Ohana restaurant at the Polynesian resort. I used a version of this recipe, minus the onions, in Quinoa Fruit Salad with Honey Lime Dressing. For this salad, the onion adds just the right zing to the dressing. 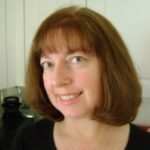 I’m imagining a fancy drink with a little pink umbrella, warm breezes and sand between my toes. 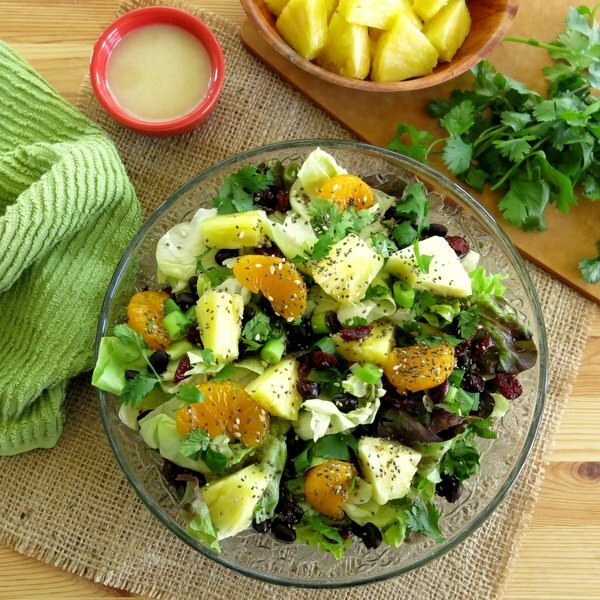 Ahhh…all thanks to this easy Caribbean salad. 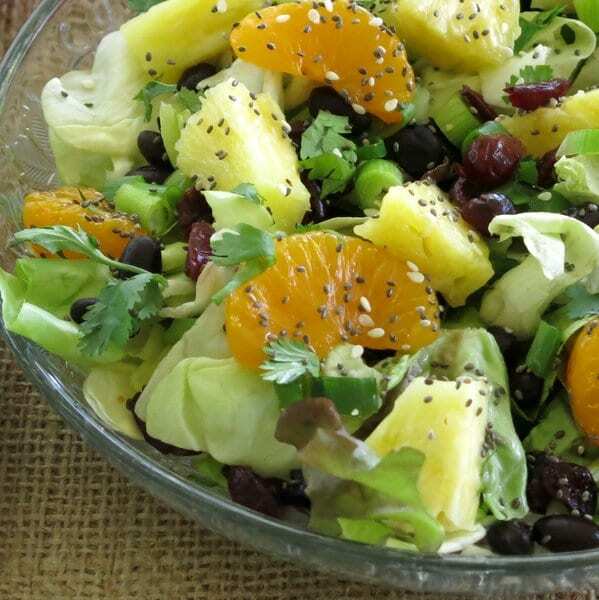 Pineapple, mandarin oranges, dried cranberries, cilantro, green onions and more will tantalize your taste buds in this Caribbean inspired salad with honey lime dressing. 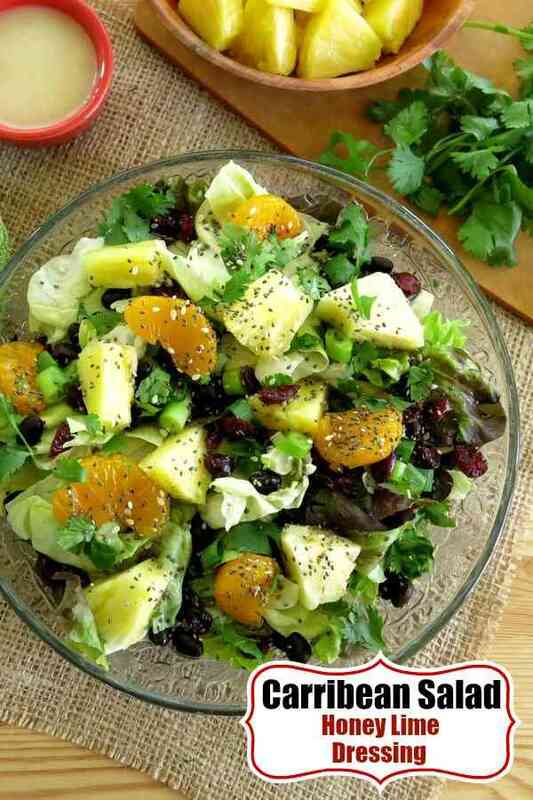 Layer salad greens, pineapple, mandarin orange segments, cranberries, cilantro and green onion between 4 plates or in a large bowl. 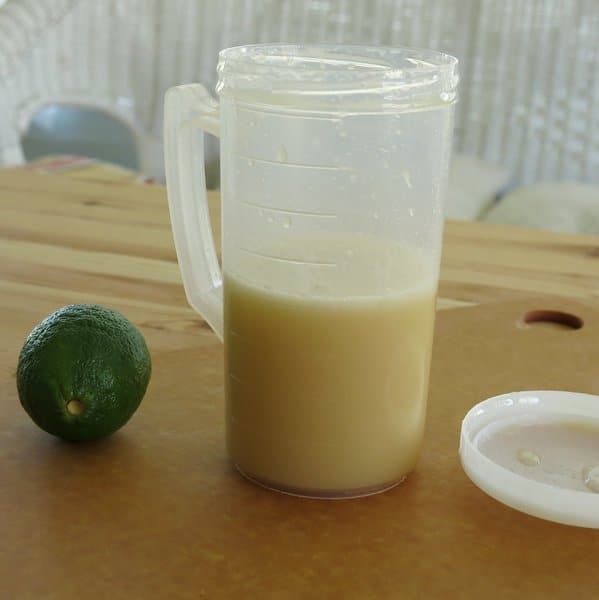 To make the honey lime dressing, add all of the ingredients to a food processor and pulse until smooth. Sprinkle Chia seeds and sesame seeds over the top. Top with black beans or desired protein. Love using apple cider vinegar in a dressing and with lime, yummo! Thanks Brenda! I love that combo too! Well, wouldn’t you know…I just bought a pound of chia seeds and need something else to use them in besides pudding. Huzzah! Lol! I have pudding on my to-do list! What a totally delicious looking salad! Love that honey lime dressing…yum! Thank you! I’ve been using the dressing on just about everything these days! Summer vacation. That term sounds so foreign now that I no longer get it! Oh well, guess I’ll just have summery salads and dream of those days long gone! I need to get on that chia train too. I love it in my granola but haven’t tried it elsewhere. Now I want a beach vacation! There’s nothing better than a refreshing salad. This one looks great! This is one seriously gorgeous salad. Love the dressing. I have to admit I’m a sucker for mandarin oranges. Big time. That looks so delicious, I could eat it now for breakfast!!! Beautiful Salad. And you bet, it sings Summer. I’m all over salads lately and this one looks so fresh! Pinning and trying soon! Thanks Deb! I crave salads more than usual this time of year! Making this recipe for a group dinner tonight. Theme is Caribbean. My question is : could nuts be added (which ones would be good?) Also, some kind of cheese appropriate?? Need answer ASAP since dinner is this evening. Hi! You can definitely add nuts such as almonds or pecans. Coconut flakes are nice addition nice too. I looove cheese. But, I’m not quite sure what you would add, possibly goat cheese or Monterey Jack…I’d put it on the side! Hope you have a wonderful evening! You had me at Ohana. Love all the food there. Great use of the dressing and making this full of Caribbean Flavor. Thank you so much! Ohana is awesome! Going to make the salad and dressing this weekend for a Caribbean themed party I am throwing. Just one question, what kind of onion did you use for the salad dressing? Just a regular yellow onion or something else? Hi! A yellow onion or…a Vidalia sweet onion is really nice this time of year. Best wishes for a fantastic party!